Turn the lights down low and get ready for the………..Rockin’ Roosters! My three little ones love music so they immediately decided to form a rock band with their new Paper Jamz™ toy musical instruments and accessories. Since they are only 3, 4 and 6, my husband and I were really impressed with the time and energy they have spent practicing for their big show. It was so much fun (and surprising) to watch them work together and create their own band. Paper Jamz is such a neat toy musical instrument product line that is already a big hit with kids of all ages. Releasing in July is my daughter’s favorite, the Pro Series Microphones from Paper Jamz. This microphone is so fun and easy to use and is perfect for anyone who likes to sing. If you are like me and love to sing in the car or the shower but probably shouldn’t……the Paper Jamz microphone comes to the rescue with Perfect Pitch™ technology which can analyze and tune the singer’s pitch in real-time with five separate modes including Solo/Duet, Auto Harmony, Auto Vibrato, Chorus and Auto. I was impressed that with this feature and I could (finally) sing a favorite song and nobody ran screaming from the room! The Pro Series Microphone came with two pre-loaded hit songs and it was very easy to download apps and sync our own favorites. There are hundreds of songs to choose from and the available selection will soon increase to thousands of songs! 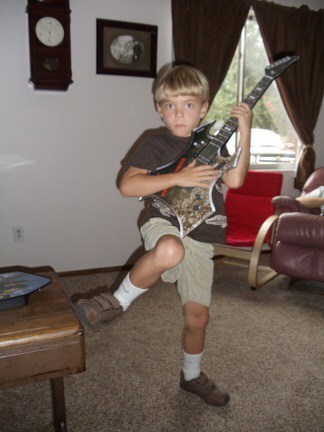 My six year old son loves to “rock it out” so the Paper Jamz Guitar is perfect for him to express his creativity. There are four modes of play with his new guitar and Adam enjoys playing freestyle the most but can also use Perfect Play, Rhythm or Karaoke. My husband and I are really impressed with the sound quality produced with this toy musical instrument and it works by using Active Graphics™ Technology which allows the child to play by just touching the surface! It is hard to believe that this virtually flat toy guitar can produce such realistic sound quality. It features a built-in speaker, line-out jack for earphone or amplifier connection and volume control (we really use this one….). There are several Paper Jamz guitar styles available for boys and girls and I am blown away with how affordable these guitars are to purchase with prices around $24.99 at major retailers. Paper Jamz also has a fun drum kit that is very realistic sounding and is easy to play. In fact, this toy has been so popular in our house that my three year old had to wrestle it away from his dad so he could play. What makes this drum kit a great idea for kids wanting to play the drums is that it small, portable and hardly takes up any space. Overall, I am really pleased with the overall quality of the Paper Jamz musical toy product line. My kids are thrilled with their new instruments and they have enjoyed played with their Pro Series Microphone, Guitar and Drum Kit several times throughout every single day. I love that Paper Jamz is affordable and inspires a continued love for music while fostering my children’s creativity and imagination. Paper Jamz products are available for purchase at major retailers in the U.S. and Canada including Target, Walmart, Walgreens and many more. These would make great gift ideas for music loving children of all ages! My nephews would love this and would like to try the microphone! We actually already have two of the guitars and my kids love them. There are many afternoons when they play rock band with these and I know the mike would be a really nice variation! My daughter has a guitar already. I visited the site and learned they also make a drum set which I am sure my son would love. Liz would like the PaperJamz Guitar. 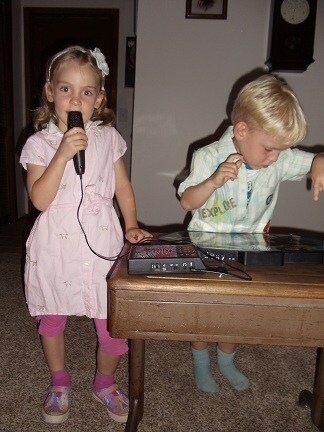 My nieces would love the microphone or even a guitar! my family would love this!! i just hope i win! I learned Paper Jamz microphone can correct the voice. Guitar Style 7 is pretty cool! Thank you so much!! my nieces will love this!! !